We have a few standard suppliers that we would like to highlight and those options can be found at the bottom of this page. Please keep in mind that fabric availability fluctuates often and keeping the website up to date would be nearly impossible. If you see a fabric here that you like, feel free to contact us before you order to make sure it is still available. 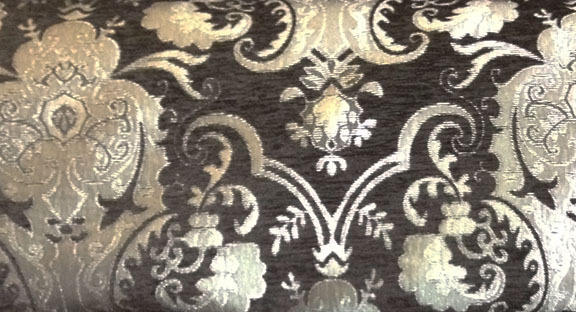 In addition to the fabrics we get from our regular suppliers, we occasionally have found nice fabrics on the internet. These fabrics will likewise come and go, so we don't post them here. If you are looking for a particular pallet, just ask. We'll do our best to find something we think you'll like. You can also surf the web yourself, and send us links to fabrics you find. Just be sure you are on a supplier's website, not Pinterest, or you may be looking at pretty pictures of fabrics that are no longer actually available. Below you will find a guide line and helpful information for selecting the fabrics for your order. As always, if you have any questions, feel free to contact us. 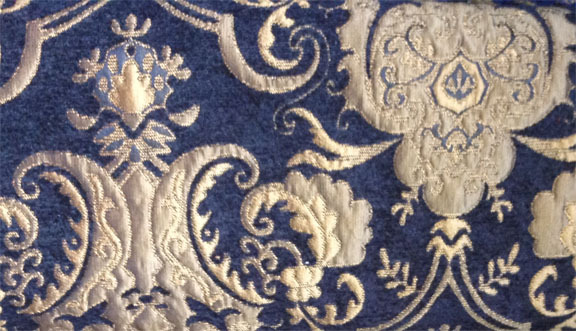 You will need to consider what type of fabric you want for your outfit: a Brocade, Damask or a Chenille. In the most basic of terms, a jacquard is a fabric with an woven pattern and comes in either a brocade (fabric woven with an elaborate raised design; multi-colored and uni-directional) or a damask (a tone-on-tone jacquard where the patterns are flat and the fabric reversible). Chenille fabric (for our purposes) has a solid color chenille thread with a second color design that is either woven into the chenille or on top of. 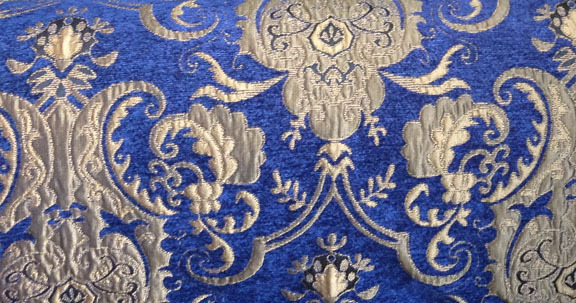 For most of our items, you will need to be looking at brocades and damasks. The Chenille would be used primary in such items and the Marlowe Doublet and the Anne Boleyn outfit. You are welcome to "shop the web" yourself and ask our opinions on any supplier's fabric listing. When you find something you like, you can let us know and we will order it directly from them for you. If you want to shop your local fabric stores and provide your own fabric, please contact us first. We don't mind using fabric you provide, but we need to make sure it will work before you spend your money on it. We give a fabric credit for "customer provided fabric", but you will need to make arrangements with us before you order. Any discount is based on the yardage needed for an individual item and the price we usually pay for that type of fabric, not what you paid. We purchase most of our fabrics downtown in LA's fabric district. Because these sources are constantly changing, a fabric that we post a picture of today, or that you see at a Faire or Con, might not be available next week. We are happy to send samples of fabrics that are currently available, either by digital picture to your email or by physical swatch to your home. We do not charge for the service, but we usually require you to have placed a paid order before we go shopping for you. Best used for doublets and the underskirt panel and coordinating pieces of an Anne Boleyn, etc. This first section is what we consider “standard” chenilles: this would be the default for ordering fabric doublets, like the Marlowe and Tragedian. Scroll down the page to more elaborate chenille options, some may incur a fabric upcharge for us in certain items.